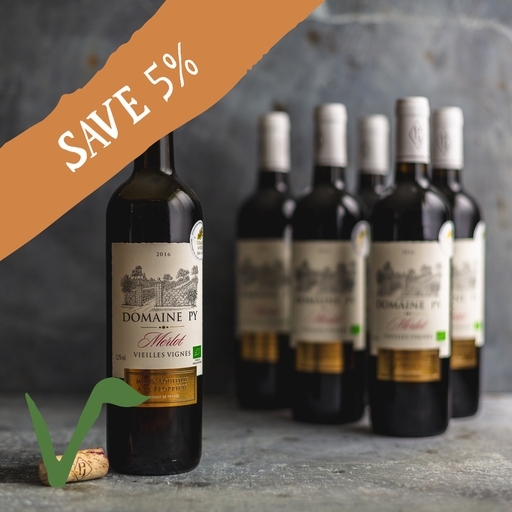 A full-bodied organic Merlot produced from mature, 30-year-old vines, this punches well above its price tag. Lively on the nose with red fruit aromas and notes of blackberry and plum. The palate is typical Merlot: velvet smooth, with warm spice-and-berry flavours, ripe tannins and an earthy finish. A great one with cured meat or goat’s cheese. Domaine Py (pronounced 'Pea') is located on the southern slopes of the 'Montagne d'Alaric' in the Corbieres area, between Carcassonne and Narbonne. It’s been owned and managed by the Py family for five generations but until recently they sold their grapes to the local coop. We’re glad they started making wine themselves and marked the Merlot’s card when we first tasted it a few years ago.